Long-time readers here will remember that one of my cats is a fiber junky. Moo Cow eats anything that is even vaguely string-like. As a kitten, she cost me $$$$$ in emergency surgery when she decided to eat the cotton drawstring from #1 Son’s pajamas and was then unable to digest it. I am very, very careful to keep all of my stash (wool, angora, mohair, alpaca, silk, blend), either in closed containers or up out of reach. While knitting along on a project, I have been the victim of Moo’s addiction – she has neatly sliced my yarn in two from underneath my chair. It’s been an issue between us. 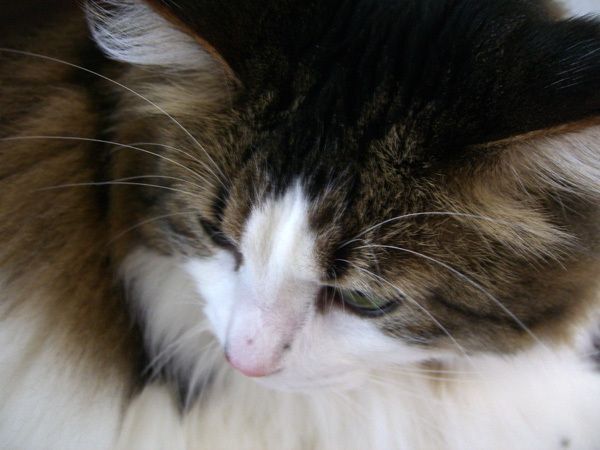 (I love Moo, but she is #1 Son’s cat without doubt.) She’s also the most maddening cat in the world to photograph because she will not hold still for even 5 seconds. It takes a fast shutter and the patience of Job to snap a pic of Moo. Now I’m going to digress for a few minutes. But only a few, I promise. Way, way back in the dim past — some time in the 1970’s I think — one of my relatives started a crocheted afghan. It may have been my grandmother, or perhaps one of her sisters. They were all very crafty and sewed, quilted, knit, crocheted, tatted, embroidered, etc. They were young in an age where those pursuits were ones that women of society did. Towards their later years, each dropped many of these crafts and concentrated on the one or two that they particularly liked. My great-aunt Jose, for example, sewed beautifully. I suspect that Grandma started the afghan in question, because she liked to crochet. The craft gene skipped my Mama and her sister. Mama had many, many admirable traits, but handiwork was not amongst them. Mama always wanted to be crafty. She tried to be. I inherited from Mama a set of pillowcases, one of which is partially embroidered (I believe she started them in the 1930’s) and a Crazy Daisy afghan kit, complete with daisy loom and acrylic yarn. She tried. But it just wasn’t her thing. As Grandma and Aunt G (Mama’s sister), lived with Mama for years after my Dads died, there were crafty things around the house that belonged to Grandma. One of them was the afghan in progress (you remember the afghan). Grandma, or whoever started this afghan, had branched out from the typical 70’s color scheme and had gone with black and bright red. We all thought it was quite striking and a little outre. The yarn was acrylic – Red Heart – because that was all that was available in my home town in Idaho apart from wool, which was horribly expensive and scratchy. The lovely fibers we have to work with now just weren’t around back then in semi-rural America. Grandma worked on the afghan now and then, and kept the project in process in an antique oak bucket that had belonged to my great grandmother — Mama always called it the sugar bucket. I don’t know if that’s what it really was, not being the sap-collecting type myself. 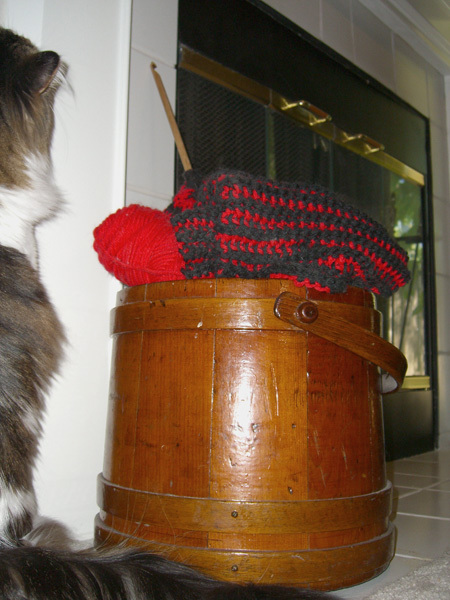 But it’s a cool bucket, and it looked so striking sitting on Mama’s hearth with the red and black afghan in it. Grandma passed away, and Aunt G moved across the country to be closer to her daughter. And the bucketed afghan sat on Mama’s hearth. I wanted that bucket in the worst way. I lobbied Mama incessantly every time I got a chance every now and then. I even worked on the afghan when I went home for a visit. To show that I was interested, you know. Actually, everybody that visited Mama worked on the afghan. She insisted. It’s a simple afghan-stitch pattern that isn’t hard to learn. Here, Mama would say when visitors came. Work on the afghan while I make some coffee. I have no idea how many hands worked on this project. By that time Mama had forgotten the afghan stitch, and wasn’t that interested in learning it again (I offered to teach her). Yes, it would be nice if the afghan got finished some day. But didn’t it look nice sitting on her hearth? So striking with the black and red in the sugar bucket. Yes, Mama. It really does look great. You know… I’d love to have that bucket some day. I’m sure you would. But you don’t have a hearth, so where would you put it? This was said with a smile, but just a little smugly. And there the conversation stopped, because Mama was right. I didn’t have a hearth. Or even a flight of stairs where the bucket could be strategically placed on a landing to be glimpsed from the entry. Or even an entry, for that matter. I lived in tiny apartments and small houses that had no place suitable for an antique oak sugar bucket, complete with unfinished red and black afghan. And then my ex and I built a house. And it had a hearth. (And an entry way and a landing, for that matter.) So I stepped up the level of my begging lobbying. Just a little. But the bucket looked so nice on Mama’s hearth, she hated to give it up. And then Mama decided to move to Portland, to be nearer her grandchild (#1 Son), and incidentally both of her children. I will not bore you at this time with the tale of Mama’s packing, which took Bro and I a week, it seemed, and included many trips to Good Will and the dump – and this was after several garage sales. You know, Mama, you’re moving into a small apartment. You won’t have a hearth…. All right. You can have the sugar bucket. But you have to take the afghan, too! No problem! And that was how I came to have sitting on my hearth a little piece I call antique oak sugar bucket belonging to my great grandmother, complete with 1/2 finished red and black crochet afghan worked on as a communal project. Since then I have become single and changed houses. But I still have a hearth. And I still have the bucket sitting on the hearth. And the afghan is still in it. I haven’t worked on it for years – not since Mama passed away – and I don’t ask my guests to work on it. But it looks so striking sitting on my hearth. Our tale now circles back to Moo Cow. You remember Moo, the fiber junky? Moo, who will eat anything even vaguely string like? Moo who will seek out and destroy my stash if allowed? Moo has never touched the afghan, or displayed more than a momentary interest in it, even though there are skeins of yarn there for the taking, and even a whole single strand of yarn leading from the skein to the afghan. She sniffs it every now and then. And then she walks away uninterested. You can see her in the picture sitting next to the bucket (she doesn’t mind sitting still for pictures she’s not supposed to be in). Moo who will devour my (wool, angora, mohair, alpaca, silk, blend) stash if not watch closely. The afghan is made from acrylic yarn, remember. Could it be that the lovely Moo Cow is not only a fiber junky, but also a fiber snob?